The world’s most future-forward city, Dubai is rising in global innovation rankings and is seen increasingly as the main innovation hub in the vast area between Europe and Asia – where emerging markets are creating innovators targeting local challenges. Just a couple of years ago Sheikh Mohammed, the Vice President and Prime Minister of the UAE and Ruler of Dubai, established Dubai Future Foundation to play a pivotal role in shaping the future of Dubai and its strategic sectors in cooperation with government and private sector entities. Which led to future forward initiatives such as the Dubai Blockchain Strategy that aims to transform key government transactions to utilize blockchain technology by 2020 – a world’s first. There were approximately 3,000 startups in MENA, 42% of which were based in the UAE in 2017. With accolades such as being voted as the most favoured city by Fortune 500 companies to set up regional headquarters and having the most free zones in the nation – contributing to UAE ranking 1st in MENA for Ease of Doing Business – it’s no coincidence that the UAE’s startup ecosystem is thriving and Dubai has become their startup hub of choice. In fact, a report from Magnitt cites that 2017 was a record-breaking year for startups across MENA with a staggering 65% increase in investments secured by startups – $560 million across 260 deals – with startups in the UAE accounting for 70% of the investments. Global Cities 2017 Report lists Dubai, the leader in business activity in the Middle East, as one the key examples of economic powerhouses: established hubs for trade and finance offer easy access to capital and investors. “Although Dubai is very much an emerging ecosystem, the government has made significant investments in developing its startup environment, and the city has always been a centre for trade and home to a substantial population of foreigners,” the report says. In October, the startup crowd from around the world is travelling to GITEX Future Stars in Dubai to partake in the region’s booming entrepreneurship culture. A young and thriving community made of more than 800+ global startups will mingle with mega-fund investors, VCs, and accelerators. Being co-located with the region’s #1 technology show, GITEX Technology Week, also gives them direct access to the region’s biggest corporate and government buyers. Startups will also converge with corporates and government entities through Innovation Challenges where they’ll work together to answer live business challenges for a chance at winning game-changing prizes. “With the overwhelming response, we had been planning a strategy to get in touch with potential clients. However several visitors already contacted us with the follow-up on our meetings from GITEX Future Stars and we already completed projects valued at approximately $35,000…. The leads in pipeline from GITEX buyers are no less than $100,000 and we had to hire resources at full force to cater to the expected growth.” said Tushar Thakker, Director of Param Labs, a startup offering solutions in AR, VR & MR. 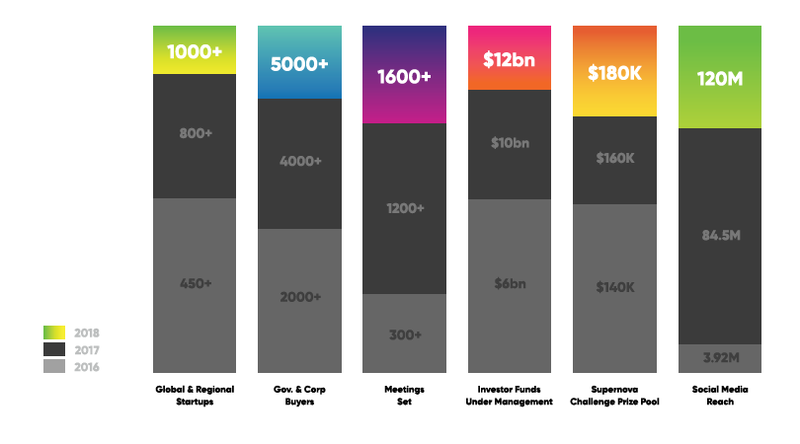 In 2017, there were 150+ keynote speakers at the conference and 250+ investors, VCs and accelerators from all over the globe with an aggregated $10Bn+ funds under management. Education and workshops feature heavily within the industry focused conference programmes, furthering conversations around AI development platforms, open data alliances, and democratised investment through the power of angels and crowdfunding and more. The cool $180,000 in the pitch competition, GITEX Supernova Challenge, is the 3rd largest pitch fund in the world and has global startups lining up to attend. The 2017 winner, Sadeem Technology, which has the ‘world’s first multi-patented flood and traffic information system’, took home the $100,000 first prize in the Best Global Startup category. “Our experience was amazing … the area of GITEX Future Stars was mind-blowing to be honest, being the winners of the event makes it one of the highlights in our timeline as a startup surely and in my life truly,” said Mustafa Mousa, co-founder and CEO at Sadeem.